Purchase DiMatteo's Wine by clicking on the categories to the left. You can select a specific Category of wine or select "All" to view all of our award-winning wines. You can also purchase tickets for events held at DiMatteo Vineyard's Tasting Room. Currently, we are shipping to six states: California, Florida, Missouri(new), New Hampshire, New Jersey and North Carolina! Our list continues to expand so check back often if you don't live in one of these states. You will be asked to "Register" with our e-commerce site prior to purchasing your wine. If you purchase a case (12 wines total), you will receive a 10% discount. Our e-commerce site currently does not allow us to provide this discount if multiple types of wines are selected to make up 12 total. We will still provide the discount but will have to offer a refund after the purchase is made. We apologize for this inconvenience and are working to have it resolved by our e-commerce provider. If you purchase 12 of the same wine, you will receive the 10% discount at the time of purchase. 100% Cherry wine. Tastes like a succulent cherry candy! 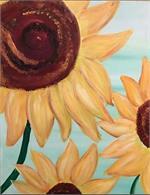 Join us for a paint and sip making this beautiful sunflower painting. Included in the price is a glass of wine and a souvenior wine glass.